Gwenn offers synergistic therapies for your health and vitality! Sessions are personalized based on your specific needs. She provides a safe environment and respects your personal boundaries. Gwenn focuses on being totally present to facilitate your process for transformational change needed for vibrant health, healing and wholeness. Sessions begin with communication to give an objective to the outcome of our time together. Open communication about what you are experiencing is encouraged during the session, as well as deep breathing to assist the innate healing wisdom of the body. The length of a session varies depending on our discussion of what you would like to accomplish during our time together and the needs of your body. Typical session times vary from 60, 75 or 90-minutes, with some clients appreciating more time together. Communication before table time is part of the therapeutic hour and is essential in assessing a direction for the session. For new clients receive $15 off your first appointment. 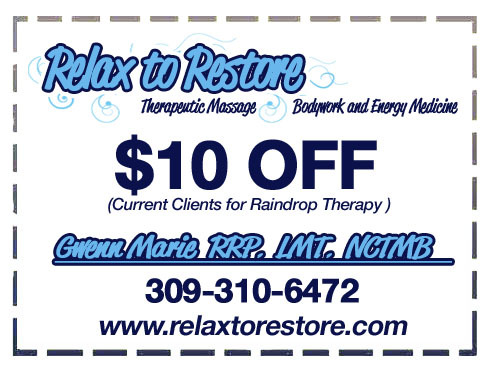 Current Clients receive $10 off our monthly therapy session. Kindly give 24 hour cancellation notice by phone at 309-310-6472. Consulting in Lifestyle changes for wellness care: Gwenn’s purpose as wellness consultant and educator is to encourage people to make the changes needed for their own personal healing. Gwenn’s role is to present them with options, so they can be an active, responsible participant in the choices they make for their wellness care. Disclaimer: The therapies and options presented by “Relax to Restore” are for educational purposes only. The options presented here are meant to complement your treatment plan by your primary care physician. They are not intended to diagnose or treat, disease and illness. Your primary care physician is available to you for this purpose.